You sense it... You know it... Your child knows her letters. He is trying to sound simple words out. She surprises you by reading a sight word. But wait... Your child is not even a preschooler yet. Should you teach a child like this to read? Where do you get started? 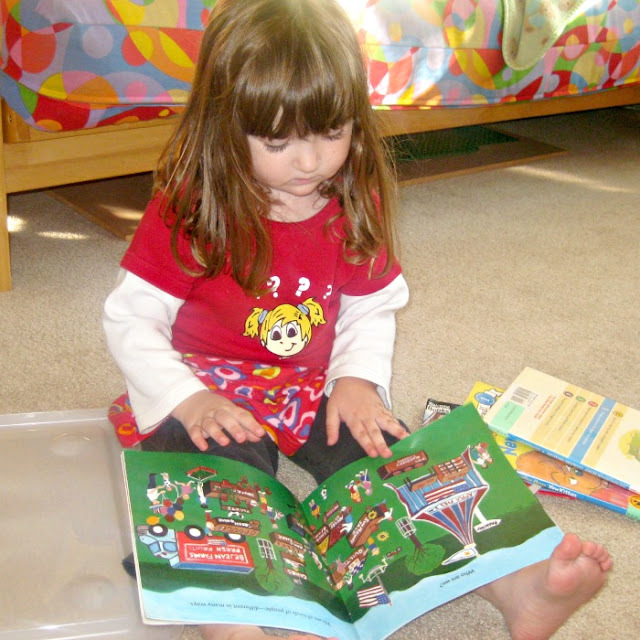 Why Teach Your Child to Read Early? Childhood Is Not a Race image (unfortunately, I cannot do attribution, since I am not sure where it originated) has been traveling on my feeds lately, so let me start this post on teaching your child to read early by saying that I absolutely agree with this sentiment. I don’t advocate teaching your children to read early to jump start their academic success or win some sort of parenting competition. I taught my child to read at the age of 3, because she wanted to learn. Her pace of mental development is faster than average, and, as her parents, we decided to meet her needs. In my opinion holding a child back simply because he or she is not “supposed” to learn something yet is just as counterproductive as pushing late bloomers forward. In this post I am going to share strategies that worked for us with hope that they will help other parents to evaluate their children readiness to read and start their eager bookworms on the journey to reading. Disclosure: I am an Amazon associate and this post contains affiliate links. For full disclosure, please click here and thank you for supporting my blog. Quality “lift the flap” books with bright realistic objects and word labels. “Look and Find” books that build both visual discrimination and vocabulary. My only gripe with these books that they tend to use franchise cartoon characters. Books that rhyme – we loved Sandra Boynton books and kept them for the “next generation”. Longer books with bright illustrations and reasonable amount of text on one page. Two of our favorites were Cars and Trucks and Things That Go by Richard Scarry and The Complete Book of First Experiences by Anne Civardi. Math and language are intimately related. English is not as “mathematical” as some other languages, but it still has a lot of clear rules, such as “word families”. Latin letters are nothing more than combinations of different shapes. A child who is comfortable with pattern and shape recognition is likely to grow into a strong reader, and these skills are a lot more important than rote counting at an early age. If you have more than one child, chances are that your second child started to read earlier simply by observing his/her older sibling learning to read. In our case Smarty is a single child, but when she turned 2 she started to attend a very small preschool in our neighborhood. That preschool was just starting out, and all students, about 12 of them, were placed together with one teacher. Smarty went there for 2 days a week 4 hours a day, but she loved hanging out with the oldest kids and do what they did. By age 2 and a half she was trying to sound out simple words, and we decided to give reading a chance. Print awareness came from reading those 1000 or more books. I credit free program Starfall for the other two components. Smarty watched absolutely no TV until she was over three years old, but since she was 1 year old almost every day I would put her on my lap and together we would spend 5-10 minutes on Starfall learning about letters and sounds through their videos. The good part about Starfall is that their reading curriculum is broken into discrete pieces with perfect duration for a very young child. 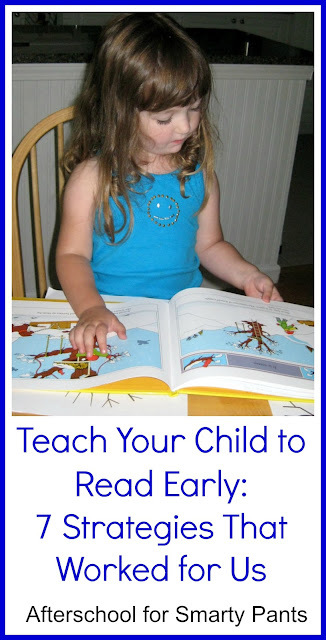 Teach your child to read in 10 minutes a day! I know that it sounds like a cheap commercial, but it’s true. I never spent more than 10 minutes a day teaching my child to read, but it was practically every single day. Learning to read is a journey, and you have to commit to making steps on this journey, otherwise you or your child might forget that you are going somewhere. It’s best to create a routine, so your child knows what to expect – our “learning to read” time was right after dinner and before our bedtime routine. Many companies spend a lot of money trying to convince you that your children cannot learn to read without using their “innovative” products. The only problem with finding a reading curriculum is that there are so many! I suggest that you look at free curriculums before you spend a fortune. When we started learning to read, I bought Bob Books, but Smarty found pictures extremely boring and refused to read “boring books”. It might have been different if I had had supplementary activities for Bob Books from This Reading Mama or 3 Dinosaurs, but they came a few years later. Then I won Teach Your Child to Read in 100 Easy Lessons in a giveaway, but their approach looked anything but easy to me, so I promptly gave it away myself. Luckily, Bob Books was my only failed investment in reading programs. By accident, I stumbled on Progressive Phonics, and that free program worked like magic for us. The idea of Progressive Phonics is that a child and a parent share reading, and they read short funny stories. In the beginning a parent reads most of the story with a child reading highlighted words, and eventually child reads more and more on his/her own. You can download your own set (and I highly recommend printing and binding it) from the link above. We had several bumps on our reading journey, when daughter would resist moving forward. First time it happened with Bob books and I decided to wait a couple of months and look for another program. She also “threw a fuss” (her words) a few times in the first couple of months of Progressive Phonics when she was saying that this is too hard. We took a break for a couple of days and I used small rewards for finishing a book (stickers or M&Ms). After about 3 months we had a huge breakthrough when Smarty suddenly switched from phonic “decoding” to sight recognition. Since then she just took off and by age three and a half she was reading very fluently. Smarty is 7 years old now, and she is a remarkably fast reader with good comprehension and recall of details. She is very articulate for her age and enjoys story telling. In her second grade they use a computerized program to test reading levels monthly. Depending on her mood, it fluctuates between 8th and 11th grade, but this is not the point. The important part is that she truly loves reading and defines herself as a person who loves books. As she puts it, My brain has no limits, because it is filled with books. Last week she had a paper on ways to deal with being angry, sad, tired, or crazy (i.e. overstimulated). Her response on each of those was read a book. And this, to me, is the best testimony of why it’s a gift to learn to read early – she gained an important way to deal with life’s disappointments, developed confidence in her abilities, and she is never bored or lonely as long as there is a good book within her reach. Of course, now we are faced with the problem of choosing those good books, but it’s a topic for a separate post that I hope to share soon in a guest post at Pragmatic Mom. Please check out my Learn to Read Pinterest Board. I will be happy to answer any questions in the comment section. K was bored by Progressive Phonics and it was much too much printing (ink!) for my taste. But she learned to read by pretending to read and then reading. The only advice I would give for a parent with a young child is to read to the child. Instruction can wait. Every time I read "Your turn," I misread it as "your twin," and it amuses me. I was always amazed at how well she did learning to read early. My boys just had zero interest in it, well they did until I tried working on it with them. I love that you started off this post with a note about the importance of the child being ready! You have shared some excellent resources here, and your approach has clearly helped your daughter become and enthusiastic and able reader. My children have learned to read fairly effortlessly, so far, but only one of them loves reading as much as your daughter! I'll be pinning this to my literacy board - thanks for putting together such a well-thought-out post! I love how her answer to initially negative emotions is something as positive and enriching as reading a book. 10 minutes a day sounds about right - and what you said about Smarty having a desire to read is really key. It is extremely difficult to teach a child of any age to read if they don't have some kind of desire to do it in the first place - a lot like potty training. Great post! My four year old wanted to learn to read, so we're in the process of teaching him. We started with Bob type books which gave him confidence because he could sound out the words, but I think now he's recognizing words/patterns (he's very mathematically minded) and wants to read harder, more exciting books. He's also going to be a big brother in two months, and he realizes that he can read to his sister in utero and when she comes out. Currently, along with daily reading, he describes the story and the pictures, along with tricky words and what they mean. Any downside to early reading? Back seat drivers! He reads all of the signs we pass. Thank you so much for the link to the Progressive Phonics books. I tried Bob Books with my son, but he wasn't very enthusiastic about them. We do pretty much the same things you've done with Smarty - read every day, read A LOT of books to him (in both English and Russian), etc. But so far it's been a slow going. His active vocabulary (in both languages) is exceptional for a 7-year old. And he eagerly listens to unabridged versions of such classics as 20,000 League Under the Sea and The Treasure Island. Still, when it comes to reading on his own, he's only now getting through the consonant blends (no long vowels yet). I hope Progressive Phonics books will give him more confidence in his reading skills. I love that you stressed that not all 3 year-olds need to learn to read. You did a great job of following your child's lead. Also love the point you made about reading to your child and all the vocabulary and concepts of print that they develop through that. Thank you so much for sharing my 100 ideas for growing a reader. I love that you have a book lover in your house. Great post - Thanks for joining in with the Parenting Pin It Party this week. What great tips!! Thank you for sharing at Sharing Saturday! There are so many great tips here! Thanks for the advice! I'll be putting some of this into action with my 4-year old! Fabulous post, Natalie! I am sharing this in my round up today.